תגיות: פולין, אופיר ביכורים, Bashert, עדי שרון. An exciting historical novel set in late-19th century Lithuania, a world of upheaval and transformations. 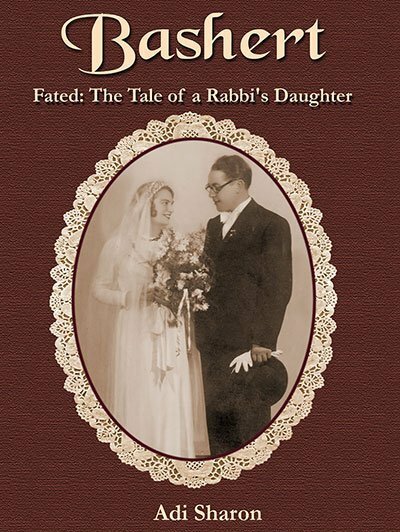 At a time when pogroms and anti-Semitism uproot millions of people from their homes, Sara Fayga Meinkin, an educated and enlightened young woman, a rabbi’s daughter, a descendant of the famed Vilna Gaon, and a Hebrew author, tries to earn an independent living. She must deal with difficulties arising within her own home, within the traditional and secular Jewish worlds, and in her dealings with the prevailing non-Jewish society. Adi Sharon first encountered the figure of Sara Fayga when she began a degree in gender studies at the Schechter Institute for Jewish Studies and Bar-Ilan University. Instead of writing a dissertation, she was captivated by Sara Fayga’s personal story and collected the little bits of information at her disposal, from authentic letters she found in archives. She then pieced the puzzle together and wrote the story of her heroine’s life—a story that is sure to draw any reader into the world of its heroes. She has been feeling strange for more than three months. Her skin is irritable, itchy, and tender. The blue velvet dress she had tried to put on that morning gave her the shakes and shivers. When she changed into a woolen skirt and white shirt, she could only touch the hem of the dress, and only with her fingertips. Suddenly she can no longer stand the touch of velvet. She has been more emotional than ever lately, and it seems that her natural propensity for crying and excitability has been magnified to the point that now she takes offense at the smallest thing. She feels insulted and embittered to the point of tears, and it takes her a long time to escape the depths of her sorrow. Yesterday she had a terrible day. Time and again, tears welled up in her eyes and flooded her throat. The pain increased relentlessly. Clara Gordovsky, the Russian language teacher, asked her at the end of recess to clear her desk in the teachers’ room of all her books before going to teach in her classroom. She gazed at Clara and felt her eyes welling up with tears. Suddenly, her memory was inundated with memories of others things Clara had said. She was always commenting—on her clothes, her hair style, her attitude toward the students—and now she’s bugging her again, asking her to organize her books. What does she want from her? Yesterday she could not calm herself down, so now she has a headache, and her eyes sting and are swollen. When she gets to work today, they will ask her again why she has been crying, and again she will reply that she has an eye infection that she hopes is not contagious. Inside she knows that her sobs caught in her throat and that she would burst into tears whether Clara addressed her or not. She strides vigorously, and the biting cold morning air fills and cleanses her lungs. She breathes deeply and picks up her pace. There is something liberating in this brisk walk, in this weather, with her hands swinging and slicing through the air. When she returns home that afternoon, she will go to her friend Meyta for advice. Meyta was a nurse in a Warsaw hospital. She recounted how she worked in the hospital for a year, caring for soldiers who had been wounded at the front, until the son of the Russian minister Zodorov died in her arms, giving the hospital director a pretext to fire her, in the hopes that it would allay the rage of the bereaved father. Since she had not completed her course of study and did not have the right certificates, Dr. Yellentzin informed her, she was fired immediately. He handed her coat to her, escorted her out of his office, and asked her never to pass through the hospital’s doors again. Meyta said that she was insulted by Dr. Yellentzin’s ungrateful attitude. So many soldiers had died of their wounds, and nobody thought to blame the doctors and nurses. If someone was wounded, and the wound got infected, everyone knew that his chances of survival were slim. And Meyta was so devoted to her work in the hospital. She suspected that Dr. Yellentzin fired her because she in Jewish and because he wanted to give her job to someone else. Sara Fayga was sorry for her friend but could not console her. She knew that many Jews desired a permanent position at a state hospital. Now, as she walked briskly along the bank toward the school, she resolved to ask Meyta’s professional opinion. It had been more than a month since the fleeting suspicion arose, and she could not shake it. It would pop up, and she would push it away… She had to speak to someone, and Meyta would be able to guide her and would also respect her request for confidentiality. She didn’t want them to know—at least not now, when they couldn’t see… She must speak with Meyta, but she is still concerned. It is not pleasant; she is afraid, ashamed of the answer. She shakes her curls and feels their soft, pleasant caress on her forehead and neck. Her book bag is heavy, but she’s almost at the school. She cautiously crosses the muddy road and takes care not to slip on the slick muck at the roadside. Her shoes are wet, a conduit for the freezing cold to enter her body. Yesterday, on her way home from work, the rain fell continuously. Now her legs are frozen and her fingers are almost numb. She adjusts her grip on her heavy book bag with her aching hand. She’ll be at the school any minute. It’s a good thing she’s early and will have a bit of time for a glass of tea, tea that will warm her innards. Any minute she will put down her bag, rub her hands together, and restore the blood flow to her frozen extremities. Despite everything, she hopes she is just sick. Nothing serious… not what she is afraid of… the bag pulls her down as though it is filled with heavy stones. She transfers it from hand to hand. Today she will return the graded tests to the students, so the bag will be a bit lighter on the way home. She stops for a moment and leans against a dark, rotten tree stump on the side of the path. She puts the bag on a rock to that it does not get dirtied by the muck mixed with rainwater. Deep breath… another breath… morning sickness is the most prominent symptom of the thing she fears, and for more than a month she has been alternately deceiving herself and calming herself down. She barely eats anything in the morning so that she won’t vomit, but the nausea doesn’t let up. She will be at the school in just a moment. She gathers her strength, holds her breath, and plasters a smile to her face. She will beam at her students; her morose mood is not their fault. Maybe that afternoon she will finally resolve her doubts… if only she had the courage to go to Meyta to tell her story, to ask and listen to her advice.